There are many unlikely pairings that go well together: grilled cheese and jam, Archie and the Predator? Indeed. Archie and his high school pals have been through a lot of make-overs in the past decade under the rule of Dark Horse. Readers have traveled the afterlife with Archie and even witnessed his death. But this journey may be a little different than the others. This time the group must evade the predator. The first issues opens with the usual cast of characters gathered outside Riverdale High discussing their plans for spring break. Tubing and the outlet mall are so over done. But before anyone can say “camping” Jughead wins a luxury beach vacation, courtesy of Tayto-Chips. The gang sets off together to Los Perdidos Resort. As soon as they land, Veronica begins to whine about being bored, clearly unaware of the title for the comic. That night everyone spots what they believe is a shooting star, but is actually an extraterrestrial hunter landing his spaceship. The kids are way too distracted by waffles and popularity fashion shows to realise that they are likely to be the next target for the teeth-face fiend. Cheryl and Jason aren’t too far away as they are cruising on their own yacht (that cool and still no friends). They stay close enough to make sure they can stir up enough trouble. Cheryl makes sure Betty wins the fashion show, ruining Veronica’s bet at being voted Best Dressed for the yearbook. A girl fight ensues, ending in move of Veronica’s fist to Betty’s nose. The blonde runs off in tears and a broken heart (over Archie. Again. Of course). She comes across a cave that was made to be a shrine for the jaguar goddess. Unknown to her, a dagger from the shrine gets stuck in her skirt. The kids have enough and head back to Riverdale where they decide home is always the best place to be. But Veronica’s luggage is certainly a lot heavier on the trip home. 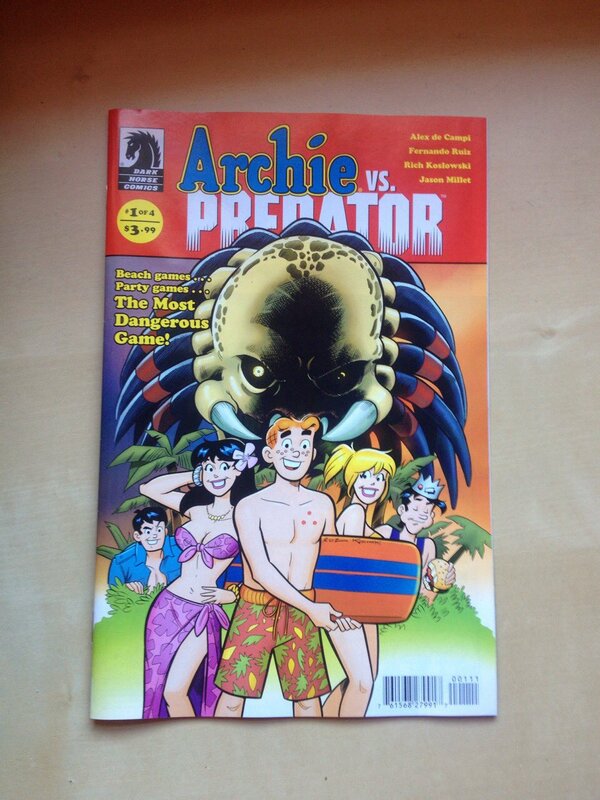 Archie vs Predator plays on several themes. In many ways, the comic evokes a sort of 80s slasher vibe. The audience catches a glimpse at the alien, but the teenagers continue on blissfully unaware of the danger lurking around them. Like the 1987 movie, the teens move around the jungle not knowing they are being stalked by an invisible alien with thermal imaging. Alex di Campi (Grindhouse) once again captures the a distinct style with her writing. She keeps the dialogue silly and light while letting the art take on an increasingly tense mood. The dynamic between the characters is over-the-top silly. Everything from the fashion show to the wishing on a star/spaceship is so ridiculous, but if the Predator has anything to do with it, things won’t stay that happy for long. There’s definitely a healthy string of ‘vs’ movies: Alien vs Predator and Freddy vs Jason being the prime examples. Archie vs Predator is different in a few ways. The films make a level playing field. In this comic, it seems a small chance that all the kids will make it out alive. This target seems almost laughably easy for the Predator. The hunter has just arrived in Riverdale with Archie and his friends blissfully unaware. Can they keep their wits about and hormones under control to survive?